Today I received a gift of a bag of English Toffee. 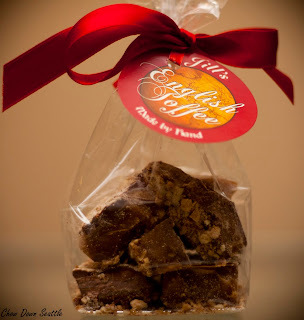 I love English Toffee, and this was some of the best I have tasted. 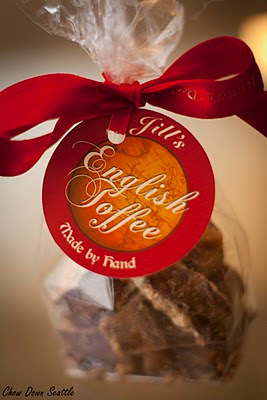 The toffee I received is Jill's Olde World English Toffee from World's Best Treats located in Redmond, WA. I checked out their website and they offer four varieties of their English Toffee: Milk Chocolate, Dark Chocolate, White Chocolate/Pecan, and Mocha. I've now tasted the Milk Chocolate, and I really want to try the Mocha flavor next. Jill's Olde World English Toffee can be purchased at select Whole Foods locations, Blazing Bagels in Redmond & Safeco Field, Issaquah Farmers Market, and Sammamish Farmers Market. 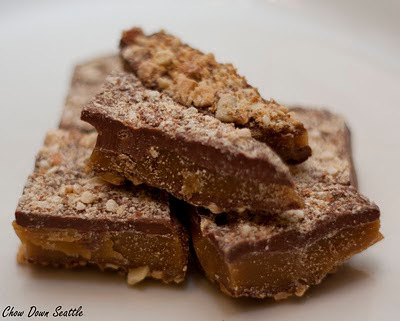 They are currently in the process of setting up an online ordering system on their website, but you can send an email to jill@oldeworldenglishtoffee.com to place an order. This toffee would make an excellent stocking stuffer this Christmas! You can find out more information about this delicious English Toffee﻿ at their website http://www.oldeworldenglishtoffee.com/.